You see, everyone’s primary job was to ensure that anyone who attended Disneyworld had an incredible experience and as a consequence of that experience, they went back to wherever they lived and told their friends and relatives about it. The idea of course was to turn the existing clients into raving advocates. “EVERYONES PRIMARY JOB is CUSTOMER SERVICE”. And when you see, hear or meet a customer… ALL OTHER duties and activities are put ON HOLD. You see, if you can prevent… 5% of your customers from LEAVING you, you will INCREASE your bottom line profit by 25% – 95%. Yet the average business… LOSES 15% of it’s customer base each year. The bad news is most of those customers that leave don’t bother to complain. And 82% of those that do leave you go somewhere else because of a customer service issue. It’s called the “Welcome to the Family “Game Changer Strategy. They get the “Welcome to the Family Box”… After they make a purchase… handed to them personally or sent immediately after the sale by mail. [your company name] just SENT ME”. 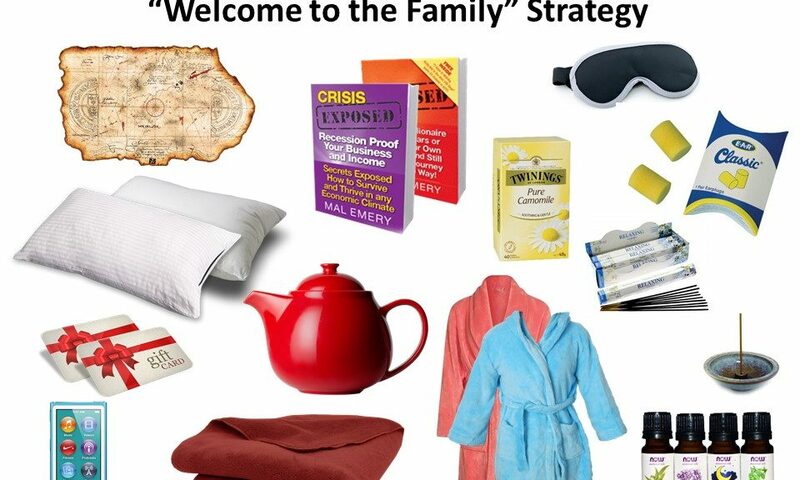 The “Welcome to the Family Box” is a GAME CHANGER so figure out how to do it. There are 2 BIG ADVANCED Secrets when it comes to developing a “Welcome to the Family Box”. SECRET #1 – The BIGGER the “Welcome to the Family Box” is the BETTER. The truth is, size does count. The bigger it is, the more impact it will have. SECRET #2 – The BETTER the “Welcome to the Family Box” is THEMED to your product or service, the BETTER. What I am asking you to do here is think about what you should put in your “Welcome to the Family” box so it resinates in some positive way with your new client. Let’s take for example, a financial planner, how can you create a big box full of stuff that is themed? Well the theme I would approach would be “peace of mind”, “Sleep well tonight knowing we are taking care of your money matters”. SECRET #3 – Include referral mechanisms that make it easy for your client to refer other people to you. And include a letter explaining how to use the referral mechanisms and how to refer people to you. After all, it’s not their job to send clients your way. That referral mechanism could be a voucher to try you out, it could be your book, DVD, CD or marketing material that is carefully crafted. If you are worried about what this “Welcome to the Family” box will cost you, for most of you this will be your first thought, think about what it costs you to get a new client, to stop a refund… To turn clients into raving advocates of you. Figure out what a client is worth to you over their lifetime and/or what is their transaction value. So instead, figure out how to build a “WOW FACTOR Game Changer Welcome to the Family” box. So if you are a visual kind of person like me, I have prepared a video presentation for you on the subject of this blog. Simply click the link HERE and follow the prompts to watch the video that reveals exactly what you need to do to create a “WOW FACTOR Game Changer Welcome to the Family” box for your business.